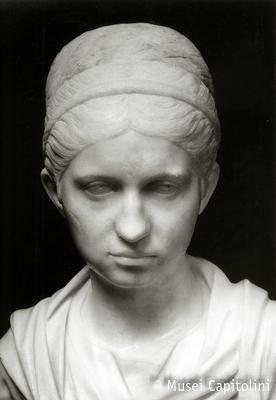 This bust portrays a young woman whose face is gently turned to the left. The elongated oval of the face is dominated by wide eyes, with iris and pupil incised, and prominent nose; the slightly protruding lips convey a sulky expression. The hair is parted in the centre and tied back in a tall knot of thick braids on the nape. This funerary portrait, that was originally placed in a burial chamber, dates back to the late Hadrianic period or to the early Antonine age. The bust was purchased by the Capitoline Museum from the collection of cardinal Alessandro Albani in 1733.